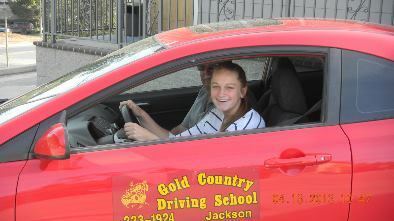 Gold Country Driving School - Amador County - Jackson, CA. Our drivers training classes satisfy the State of California's requirements for obtaining a drivers license. We will guide you through the entire process of getting a drivers license from obtaining a permit to prepare you to take the driving test. Drivers training is the in car portion of the student’s training. We offer lessons seven days a week, starting at 8:00am and ending at 8:00pm. If you would like to set an appointment or have any questions regarding the cost please call us at (209)223-1924. California law requires all persons under the age of 18 to complete a course of no less than six hours of drivers training with a licensed instructor. When you have passed the written permit test, and receive your permit, you may not drive until your permit has been validated. The permit is validated once you take your first drivers training lesson. The required six hours are broken down into three lessons, each are two hours. These lessons should be spread out through the six months to a year mandatory waiting period on the minors permit. All lessons are private and are offered with a wide variety of instructors and vehicles. In addition to the lessons described above, the law states that all persons under age 18 complete 50 hours of driving practice with their parent/guardian, or licensed California driver age 25 or older. Ten of these hours must be at night. Person over the age of 18 may schedule the behind the wheel driving test at the DMV without drivers training (there is no mandatory waiting period for adults); however it is highly recommended that everyone, regardless of age, take a drivers training lessons. The modern DMV drive test is complex. The DMV expects the license applicant to be able to perform a number of maneuvers in a specific way. Many people find that the drivers test is more difficult than they expected. For each scheduled lesson, you must bring your learners permit (you must have this on you at all times when you are driving), the correct payment for that lesson, and a good attitude. On your first driving lesson, you will be issued a student progress card. This card was designed to track all your achievements throughout your training process. Each two hour lesson will provide the student with the knowledge and the know how of the laws and rules of the road. Here is a brief summary of what you can expect on each of the lessons.